Today is World Poetry Day and I’ve been reflecting on poetry in my life in varying shapes and forms. Or devils from some fiery hell? But I must be doing something right – I have had my first poetry submission accepted for publication (coming up in the next few months). 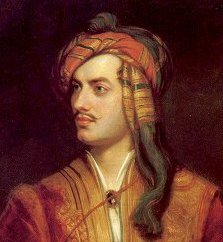 I’m not even a big Byron fan – I’ve tried, honestly, but his work just doesn’t resonate with me. I much prefer Andrew Marvel’s To His Coy Mistress – gets me every time. Samuel Taylor Coleridge’s Kubla Khan was the only poem I learned by heart and I could read and study and analyse Slyvia Plath’s The Arrival of the Bee Box time and time again. Then there is that one poem that will live with me always, carried on childhood memories of my dad’s recitals, complete with funny voices and actions: E. V. Rieu’s Sir Smasham Uppe – if you’ve never read it, it is definitely worth a look! Not poetry as such (but definitely poetic) are song lyrics. I grew up to a soundtrack of Buffy Saint Marie, Bob Dylan, Loudon Wainwright III, Patti Smith, The Pogues and Woody Guthrie. I got into writing songs because I loved to sing. Inspired by Radiohead, The Clash, Indigo Girls, PJ Harvey, I learnt to play guitar. Like Radiohead told me, “Anyone can play guitar / And they won’t be a nothing anymore” (Anyone Can Play Guitar – Pablo Honey). I didn’t have the greatest voice but that never stopped me singing loudly and expressively. Then of course there is the beauty of a poetically written phrase, the kind that you sometimes find in prose. The works of Jeanette Winterson are sprinkled with such gems. “Singing is my pleasure, but not in church, for the parson said the gargoyles must remain on the outside, not seek room in the choir stalls. So I sing inside the mountain of my flesh, and my voice is as slender as a reed and my voice has no lard in it. When I sing the dogs sit quiet and people who pass in the night stop their jabbering and discontent and think of other times, when they were happy.” Winterson J. Sexing the Cherry, Vintage, London, 2001. Though I have been writing stories, songs and poems since I was eight years old, it has been Jeantette Winterson and Radiohead who have most inspired me as an adult – I think if I could be half as good as them, I’ll be well on my way! This entry was posted in Link, Poem and tagged Poetry by mjsweeney1. Bookmark the permalink.